Two supersonic NASA jets were swallowed whole by the space agency's outsized Super Guppy Transport plane in California this month so that they could be ferried to Texas. The pair of retired T-38 jets, which are no longer airworthy, were loaded into the Guppy on March 18 at NASA Dryden Flight Research Center in Edwards, Calif.,and flown to El Paso. The jets' parts will be cannibalized and used for other T-38s that are still flying. 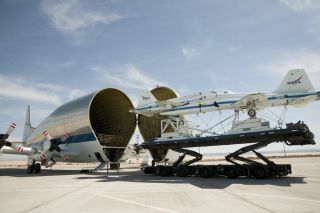 The loading process, which took over two hours, involved opening the Guppy's nose and hoisting the T-38s onto a specially designed pallet that was put into the Guppy's 25-foot (7.6-meter) diameter "stomach" of the NASA Super Guppy aircraft. Only the T-38s' wingtips needing to be removed so that the jets could fit inside the carrier, Johnson Space Center flight engineer David Elliott, the Guppy's project manager, said in a statement. The first Guppy aircraft, called the Pregnant Guppy, was built from a heavily modified KC-97 Stratotanker in 1962 by the California-based company Aero Spacelines. Its 19-foot (5.8-meter) diameter cargo compartment was the largest such cavity of any aircraft at the time and it was designed to hold the second stage of a Saturn rocket for the Apollo program. The next generation, Dubbed the B377SG Super Guppy, was built in 1965 and was outfitted with a 25-foot (7.6-meter) diameter cargo bay, more powerful turboprop engines, a pressurized cockpit, and a hinged nose for easier loading of cargo, according to NASA. The planes were operated by Aero Spacelines until NASA purchased the aircraft in 1981. The space agency still uses the Super Guppy Transport — the last generation of Guppy that Aero Spacelines built. The plane is slated to bring the Orion Heat Shield from Textron Defense Systems near Boston to NASA's Kennedy Space Center at the end of March. The U.S. Department of Defense and government contractors also have used the Guppy to ferry aircraft and large components around the continent.